If President Trump pressured then-FBI Director to stop investigating his former national security adviser, “It would be unthinkable,” Sen. Mark Warner said Sunday in an interview with CBS’s Face the Nation. Warner is the t0p Democrat on the Senate Intelligence Committee that will hear testimony Thursday from Comey, whom Trump fired last month. “We’ve known since Watergate that rules of the road were, you know, a president shouldn’t intervene in an ongoing investigation, particularly the case if it involves individuals that are close to that president,” Warner said. While it may seem “unthinkable” to pressure an FBI director to stop an investigation, it’s exactly what Comey said happened in a memo in February. Comey also said Trump asked the then-FBI director to pledge his loyalty tot he president. 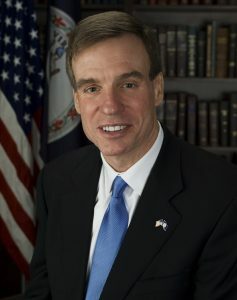 “I want him (Comey) to reinforce, one, the fact that the Russians directly intervened in our elections, which everybody accepts except for the president and maybe Vladimir Putin,” said Warner. Jim Comey deserves to have his, in effect, day in court since the president’s disparaged him so much,” he said. Posted: 6/5/17 at 10:13 AM under News Story.